The sound-recording and broadcasting equipment manufacturing company decided to bring its manufacturing, research and development and administration functions together. They found a country house garden site, near Oxford. The building has a square Palladian plan on two-storeys, with a flat roof and central top lit atrium. 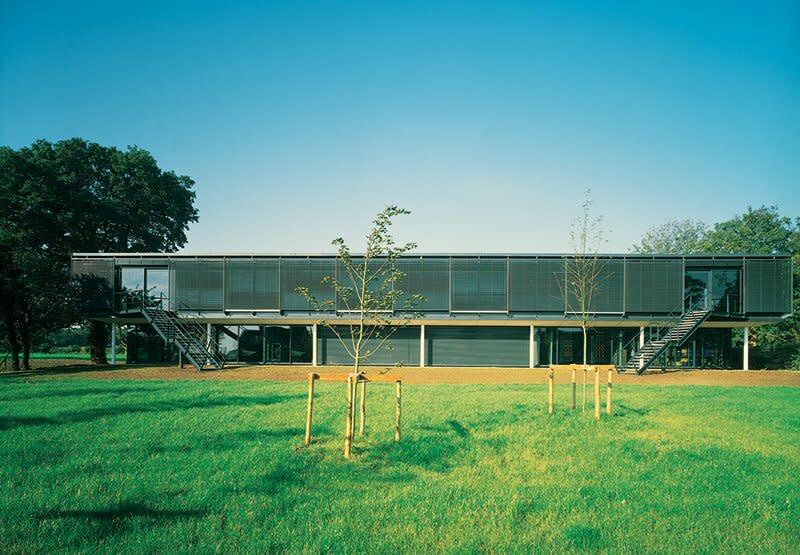 The first floor overhangs the ground floor around the whole perimeter, shading the lower level. 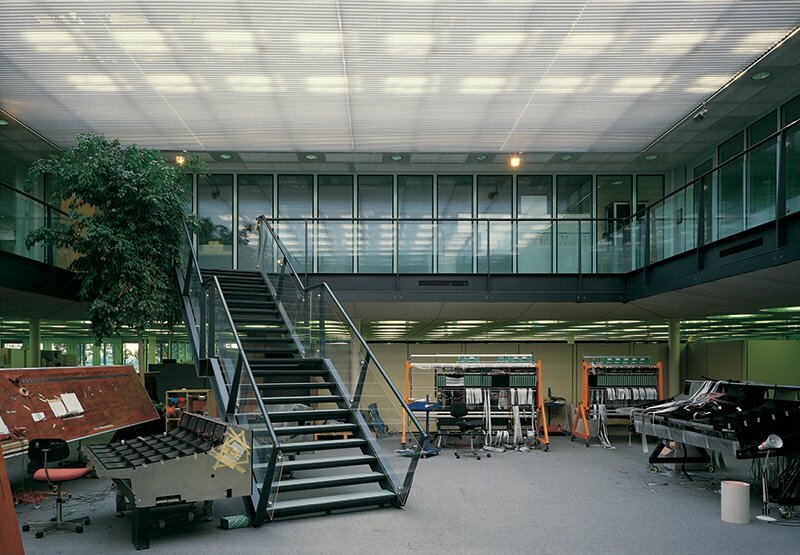 The accommodation within is flexible on a 1.8m grid, but originally arranged with manufacturing functions below and offices above. Circular fireproofed steel columns support a concrete first-floor slab, which has an exposed coffered soffit. On the upper floors the span is doubled and the columns support a steel space deck, concealed behind a perforated-metal suspended ceiling. 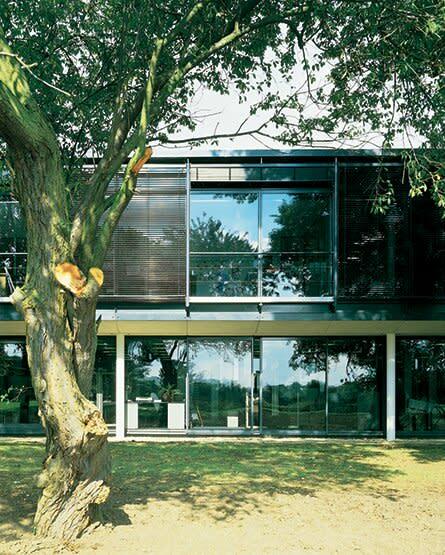 Although the external walls are all glass, this is an energy efficient building, naturally ventilated, through full height sliding windows, with some mechanical assistance but not air conditioned. The compact plan minimises heat loss. On the first floor the windows open onto narrow steel balconies supported on subsidiary steel columns bracketed off the main structure. 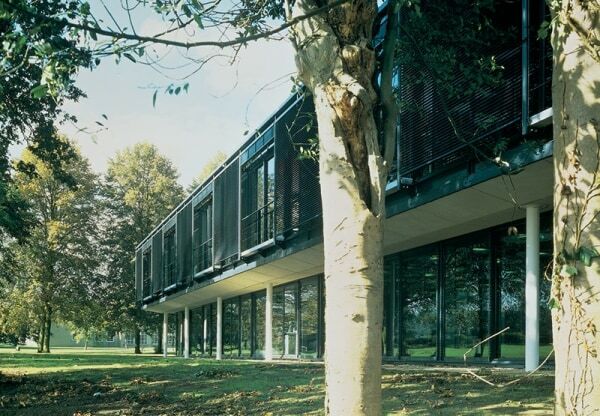 These also support external motorised louvres.